Samyang 12mm Fish Eye prime lens presenting in great condition, with only some minor signs of previous use. Lens comes in a new LowerPro soft case. 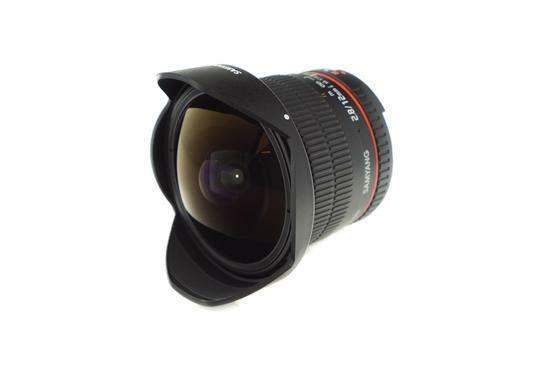 The 12mm f/2.8 ED AS NCS Fisheye Lens for Canon E-Mount from Samyang provides a 180º diagonal angle of view on full-frame cameras for an ultra-wide angle, distorted perspective that is useful for architectural interiors, landscapes and creative experimentation in any photographic application. The f/2.8 maximum aperture is effective in low-light situations and enables some measure of shallow depth of field control.